GUM® ActiVital® Sonic Battery Toothbrush / Gee Whiskers! I've generally always been very aware of the importance of a good dental health routine especially after a few fillings I had to have done when I was a child. 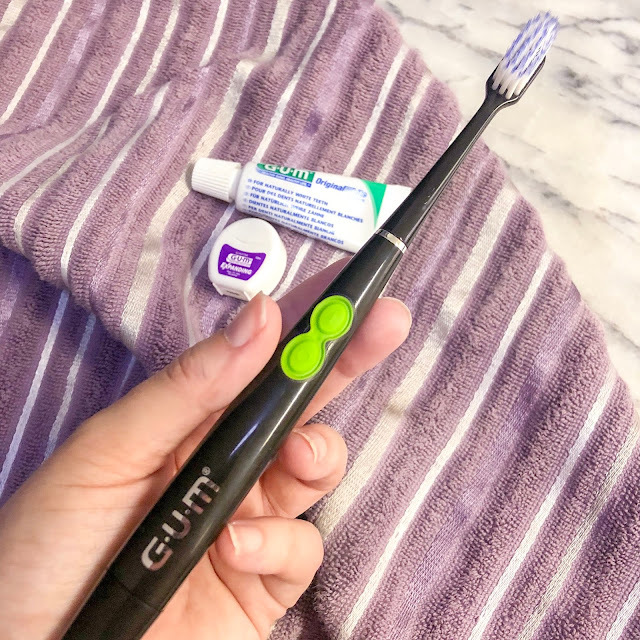 I get really excited when trying out new dental products and the ones I get gifted by IvoHealth are always such a treat because I am a big supporter of their GUM SunStar products. I personally buy the whitening mouthwash and dental flosses regularly because they are so effective. I also use one of the travel toothbrushes for my trips with JP. Recently I was sent the ActiVital Sonic Battery toothbrush to test drive and its really impressive. This toothbrush runs on a single AAA battery which vibrates at 12000 cycles per minute. This cleans teeth and stimulates your gums unlike any manual toothbrush. The bristles are ultra-tapered which are 50% more effective in reaching interdental spaces and can even reach deeper below the gum line to remove plaque buildup. When I first started using this, I found the feel of the toothbrush to be very similar to that of a manual toothbrush but as soon as I switched it on I had a similar experience to that of an electronic toothbrush. It is incredibly light and fits so nicely in my hand. The thing that surprised me the most is how powerful this toothbrush is. Especially considering that this runs on a single AAA battery, I really didn't expect it. 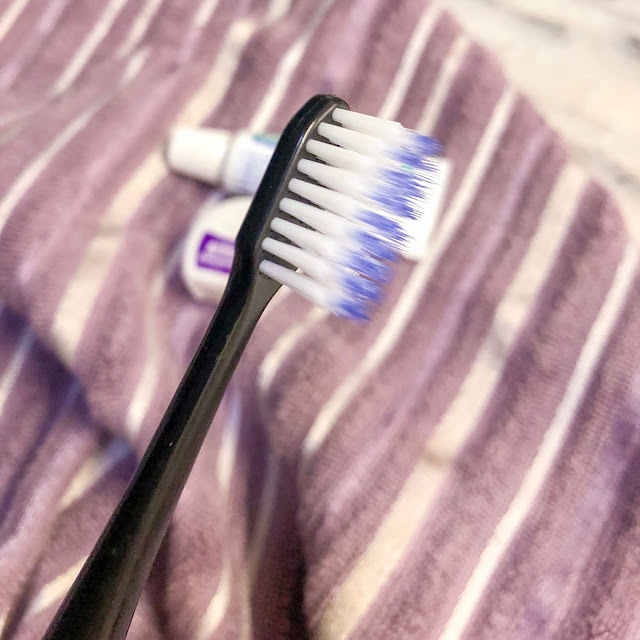 The bristles are very soft so you don't have to worry damaging your gums and I also like that the head of the toothbrush is on the smaller side which makes it easier to get right to the back of my mouth. Another really positive thing about this toothbrush is that is is really good value for money. The initial purchase will cost you R249 - which gives you the electronic toothbrush, a toothbrush head, travel cap and travel cap to protect the toothbrush head. When it comes time to replace the toothbrush head, you can get 2 replacements for only R86. That is really incredible because there aren't many really great manual toothbrushes for around the R40 mark and I know with my current electronic toothbrush I pay over R100 per replacement. So now for the big question, "Will I stop using my current more expensive electronic tooth brush?" ... most likely not because it is just better - but I can't compare a toothbrush that I paid over R1500 for to a R249 toothbrush. It isn't a fair comparison. "Will I continue to use this toothbrush?" - Absolutely yes! I definitely will be using this toothbrush for weekends away and for my longer trips. I usually am forced to take a manual toothbrush on my overseas trips because my electronic toothbrush is on the heavy side and I would also have to take my charger with me. For overseas trips every single gram of weight has to be considered so I usually end up taking a manual toothbrush with me and I really don't like using a manual toothbrush - in fact I hate it because I can feel that my mouth isn't properly cleaned. If you are a manual toothbrush user, this toothbrush is a perfect replacement and you'll immediately start getting the benefits of a better teeth cleaning experience. I really appreciate the fact that this is such an affordable way to improve your dental health care routine and that the on going costs of using it aren't terribly high. These Dentist Teeth Whitening product is really incredible, thanks to shared with us. Your teeth whitening products is really good. Here we provide Cosmetic Dentistry Services in Sugar Land.